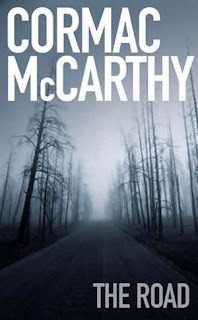 The Billionty-Oneth Geek: Cormac McCarthy's THE ROAD!! The Road was written by author Cormac McCarthy, who also wrote No Country For Old Men which was adapted into the Academy Award winning movie. This is the first book by McCarthy that I've read and the only reason I decided to pick it up is that I wanted to go on a journey. And boy, did he bring me on a journey. The story takes place in a post-apocalyptic world where the few survivors left live their lives as scavengers and nomads, raiding each town they come across. We don't know exactly what happened to the world, but we know it's ashen, to the point where the sun is blocked out; darkness is abundant where hope is limited. Throughout the book we follow two characters only known to us as The Man and his Son. They begin somewhere in the middle of America and journey south to the coast. It's a cold world and the Man figures that it will be warmer if they headed south, but not knowing for sure. They journey from town to town scrounging for whatever morsels of food that they can. They have no hope left in the world. The only hope they have left is in each other. I found the book quite harrowing and bleak. It was bleak to the point where I felt sad about my own life even though it had nothing to do with what was going on in the story. As I was reading it, I found that I was digging deep to those moments of sadness in my own life. It sounds like a bad thing, but really, this is a testament to powerful writing. I think what made it really work was McCarthy's ability to paint sceneries and descriptions with his words. With every flip of the page, we can taste the crumbs that they're eating and we can feel the tears that are in their eyes. It's a gripping and sad story, but thankfully the ending gives us a glimmer of hope. The story was adapted into a movie that was released this past fall. I haven't seen it yet, but I hear it's a faithful adaptation of the book. This was a great read though and I highly recommend it. Later geeks. "They ate well but they were still a long way from the coast. He knew that he was placing hopes where he'd no reason to. He hoped it would be brighter where for all he knew the world grew darker daily." Wow. You're quite the painter of words yourself!